Silvia also wore a diamond riviere with a round diamond pendant, the family's small diamond and ruby brooch (worn at last year's ceremony by Crown Princess Victoria), and diamond earrings. We got a glimpse of Silvia's rings and bracelets during the ceremony itself. Here's a full-length look at Silvia's red gown. Crown Princess Victoria wore the Connaught Diamond Tiara, which she also sported earlier this year at her brother's wedding. 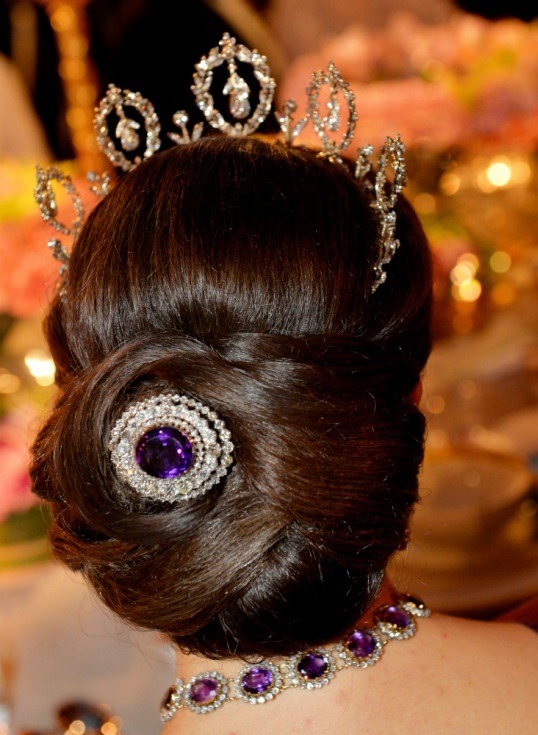 She paired the tiara with the necklace, earrings, and brooch from the family's amethyst parure. Victoria wore the diamond "zig-zag" bracelet on her right wrist. I love that the Nobel dinner gives us a chance to see the jewels royals use to secure their order sashes; this year, Victoria chose a small round diamond brooch. She also has an additional brooch from the amethyst parure placed in her hair. Princess Madeleine gave us a delightful bejeweled surprise at the ceremony, wearing the gorgeous Aquamarine Kokoshnik that belongs to her aunt, Princess Margaretha. It's one of my all-time favorite tiaras. I might have squealed. I'm not proud. Madeleine also wore the family's rather magnificent diamond floral earrings. Photographs from the dinner also revealed that she wore a small diamond and pearl brooch to secure the back of her order sash. Here's a better look at the gorgeous gray gown. This year was Princess Sofia's first tiara appearance at a Nobel Prize ceremony, and she made a safe choice, wearing the same diamond and emerald tiara that she wore at her wedding in June. She also added a pair of diamond and emerald earrings. 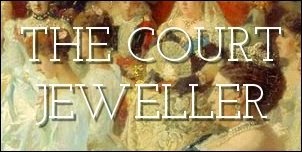 Not all of Sofia's jewels were newer acquisitions, though -- she also wore the diamond lozenge brooch that had belonged to Victoria of Baden. Last year, Crown Princess Victoria wore the same brooch in her hair. Here's a better look at Sofia's gown, which was made by Oscar de la Renta. Which jewels from this year's Nobels in Sweden are your favorites?